Ellery Biddle, Lisa Ferguson, Weiping Li, Hae-in Lim, and Sarah Myers contributed to this report. Screen capture from #KholoBC music video denouncing YouTube block. This week's report begins in the EU, where the European Court of Justice issued a ruling on May 13 that favors the hotly-debated “right to be forgotten”, or the individual right to have some control over what results can be seen when one’s name is entered into a search engine. Saudi blogger Raif Badawi was sentenced to 10 years in prison and 1,000 lashes for “insulting Islam” last week. Badawi founded Saudi Arabian Liberals, an online forum debating the role of religion in the country, in 2008. His lawyer has also been jailed for setting up a human rights monitoring group. Politician and vice-chairman of the Democratic Action Party Teresa Kok was charged with sedition for a satirical video she posted on YouTube, titled “Onederful Malaysia.” Kok could be sentenced with up to three years in jail for the video under the Sedition Act—legislation that dates back to Malaysia’s days as a British colony. Venezuelan free speech activist and leader of the SOS Venezuela movement Rodrigo Diamanti was detained by national security forces at Caracas’ international airport last week when he attempted to leave country. He was released on probation two days later. The offices of Diamanti’s NGO “Un Mundo Sin Mordaza (“A World Without Gag Orders”) were raided by security officials a week prior to his arrest. Eight young democracy advocates in Azerbaijan were sentenced by the country’s Court on Grave Crimes to prison, for crimes ranging from hooliganism to illegal possession of firearms. Each of them was initially arrested in connection with a series of protests organized online, but in September 2013, they were handed new charges connecting them with organizing mass riots and violence. It is widely believed that the charges were fabricated by officials and that the sentences were motivated entirely by political interests. Nigerian bloggers Blossom Nnodim and Nwachukwu Egbunike, along with Global Voices editor Ndesanjo Macha from Tanzania will run an Africa-wide tweetathon on Wednesday, May 14 (from 1-4pm GMT) calling for the release of the nine bloggers and journalists currently being detained in Ethiopia. Four of the bloggers are members of the Global Voices community. 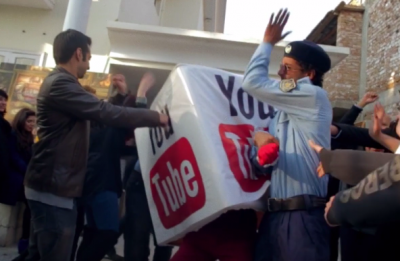 Free Expression: YouTube back on in Pakistan? The High Court of Lahore stated on May 13 that YouTube must be unblocked in Pakistan, in response to a challenge lodged by Pakistani NGO Bytes for All. The decision comes 20 months after the site was blocked by the government in response to the controversial “Innocence of Muslims” film trailer. The High Court’s decision does not mean that YouTube will be accessible immediately—the plaintiff must now initiate a new request before the Supreme Court. But the decision is step in the right direction. Privacy: Careful what you snap! Mobile messaging app Snapchat reached a settlement this week with the US Federal Trade Commission over allegations that it misrepresented how easy it was to save messages from the service, which advertises itself on the basis that photos and videos on the platform vanish without a trace. The settlement may set a precedent for other services that make similar promises about security and anonymity to their users by introducing fines if they violate users privacy, according to the New York Times. After initially saying it would propose rules allowing content companies (like Netflix or Google) to pay Internet service providers (like Comcast or Verizon) to speed the delivery of their content online, the US Federal Communications Commission appears poised to provide more scrutiny on these types of deals, while “sticking to the same basic approach,” whatever that means. Rather than establish net neutrality as policy, the FCC seems prepared to take a good cop/bad cop approach to managing telecom firms, promising to punish them if they abuse their new privileges. To experts, this looks more like an attempt to appease Internet companies like Google and Facebook than an actual change of plans. A team of researchers at the University of Michigan found what it called “major risks” in Estonia’s Internet voting system, and has urged the country to immediately freeze the system due to the vulnerabilities. According to the group, which was officially accredited to observe the system during municipal elections in October 2013, there are problems in the operational security, transparency measures and software design putting the system at risk. They note that Estonia is the only country in the world that relies on Internet voting “in a significant way” for its national elections, and plans to use the system for European Parliamentary Elections this month.